Good news continues for the family – and friends – of the Kyle and Kala Pelster family. As previously reported, two-year-old Logann Pelster underwent surgery after a tumor was found on his brain on May 6. The report on the tumor came back with great news – the tumor, categorized as pilocytic astrocytoma which usually occurs in the cerebellum near the brainstem, was benign. 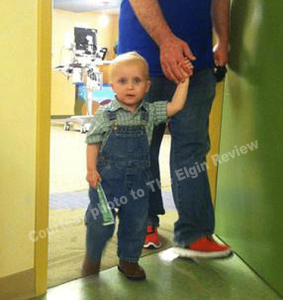 On May 14th, Logann was moved out of the PICU at Children’s Hospital in Omaha, into his own room and began eating. He progressed well and was released to begin rehabilitation at Madonna Rehabilitation Hospital in Lincoln. Great news for the family, however, the medical bills are not going away. A fund has been established at The Bank of Elgin to help the family with these medical expenses. Those wishing to help but not living near Elgin can also help through a A GoFundMe account that has also been started, gofundme.com/iwt2nc.